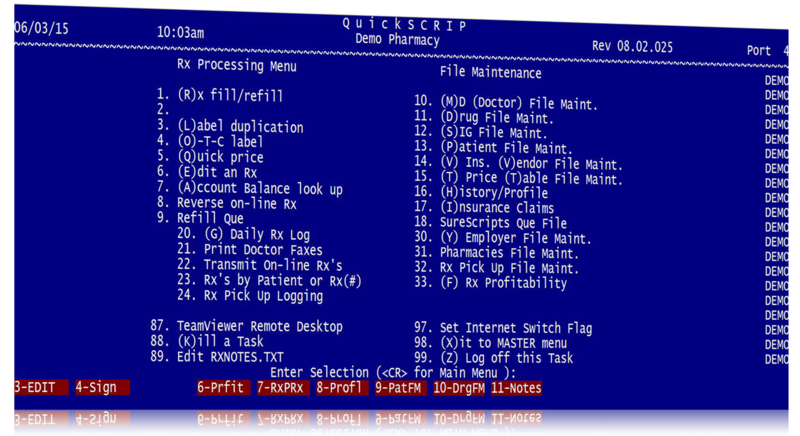 Pharmacy System designed by and for the independent retail pharmacist. With over 300 users in 8 states, QuickSCRIP provides the answers to your operating needs. Our support team is highly skilled and 100% US based. Its all in the name. QuickSCRIP is geared toward speed and flexibility. You won't waste time clicking through menus or scrolling through options. In fact you won't even need to take your hands off the keyboard! Enter the number that corresponds with the particular task your trying to accomplish and you're instantly taken to the next screen. This number-option navigation makes QuickSCRIP easy to learn. It doesn't stop there. The no-frills interface means it's powerful enough for veteran users to blaze through tasks. Keep data organized. Meet File Maintenance. Keep organized data for patients, drugs, doctors and more with File Maintenance. Link patients together to structure families that can share card information, or even charge accounts. File Maintenance can also attach insurance card images and driver's licences to patient profiles. 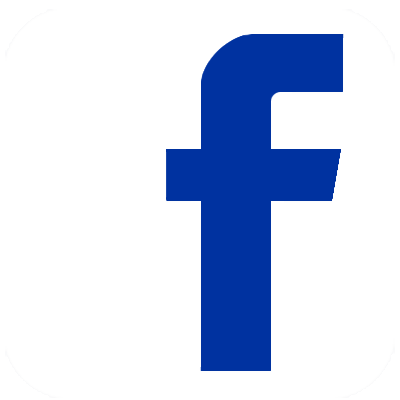 Link brand and generic drugs or create special pricing for select drugs. 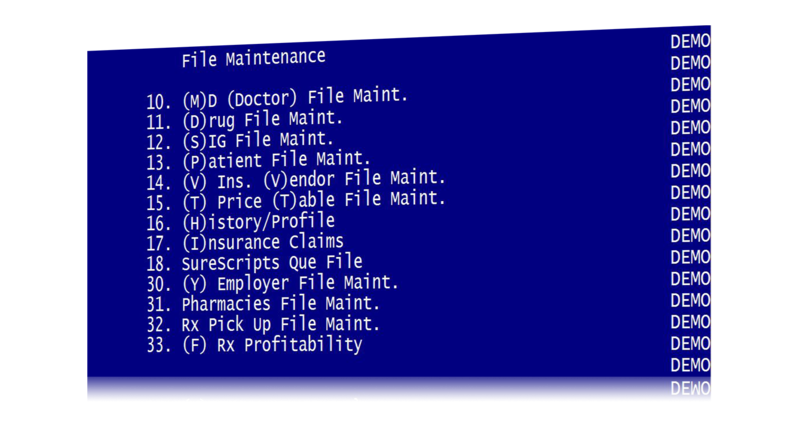 File Maintenance also tracks usage and inventory for all your drugs. 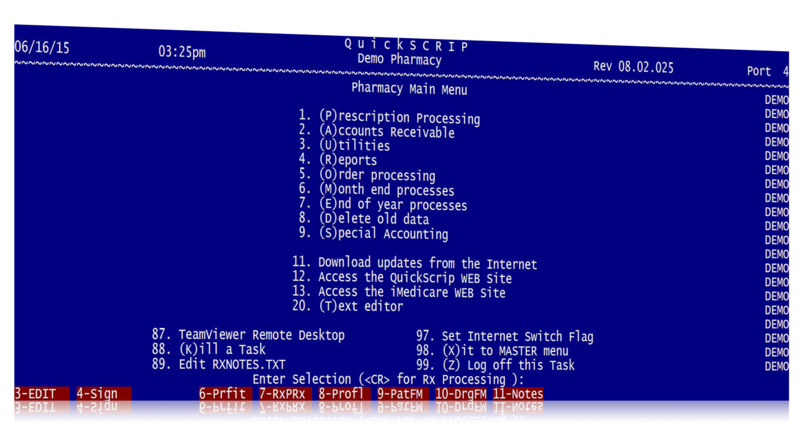 The QuickSCRIP system puts you in control of the features you need for your pharmacy. Labels and reports have generic templates, but the real magic is being able to customize them exactly how you want. Business management solutions like charge accounts, perpetual inventory and payroll are built right into the software. 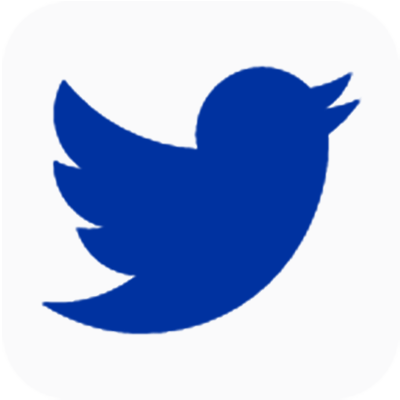 Entire programs have been written within QuickSCRIP by user request.